The Feiyu G5 is the last Gopro gimbal of the famous Chinese stabilizers manufacturer. Nowadays, Feiyu really doesn’t have to prove its worth. Indeed, it really has become one of the key player on the market, and this, for years now. The Feiyu G5 is one of the best Gopro gimbal you can find on the market and it has a significant advantage : it works perfectly under the rain or snow. Yet, this is not its only advantage. FeiyuTech has decided to call it the Splash Proof. As you can see in our Feiyu G5 review, this is the fact that this handheld Gopro gimbal is perfectly water resistant. 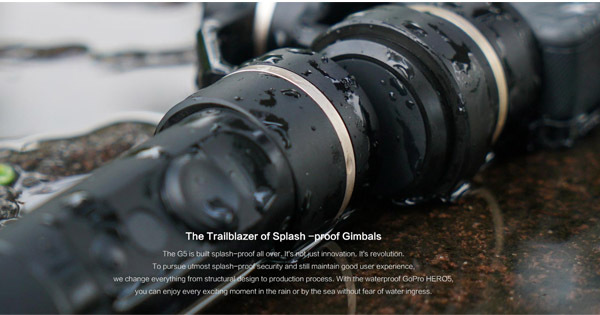 Well, be careful… This doesn’t mean that your gimbal is waterproof. Indeed, it can’t go under water. The Splash Proof means that it can work without any trouble under a heavy rain or snow. Yet, it will be totally broken if you go under water with it, be it in a pool or in the sea. Still, this is already very pleasant to have a Gopro gimbal that can work under these conditions. Indeed, if you use it with the Gopro Hero 5 Black, which is perfectly waterproof (this one can go under water), then, you’ll have the winning combination. 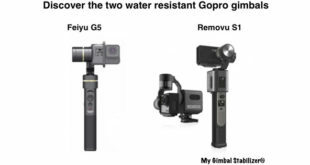 In the end, this is something we really enjoyed BUT, we still prefer the water resistance of the Removu S1, the other Gopro gimbal which offers this option. The reason of this choice is that with the latter, you’ll be able to use the Gopro Hero 3 and 4 under water, thanks to a protection chamber. Here, you’ll be limited to the Hero 5 Black as the other action cameras are not water resistant. As you can guess, this is not the only asset of this handheld Gopro stabilizer. Indeed, what we also really enjoyed during our in-depth Feiyu G5 review was its very good battery. According to you use, it will work between 6 and 8 hours. 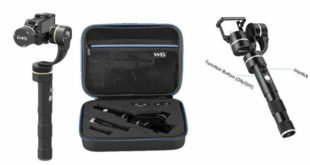 This is really great and we have to add that you’ll be able to recharge your Gopro while in use, which is a real advantage compared with other gimbals which do not offer this function. 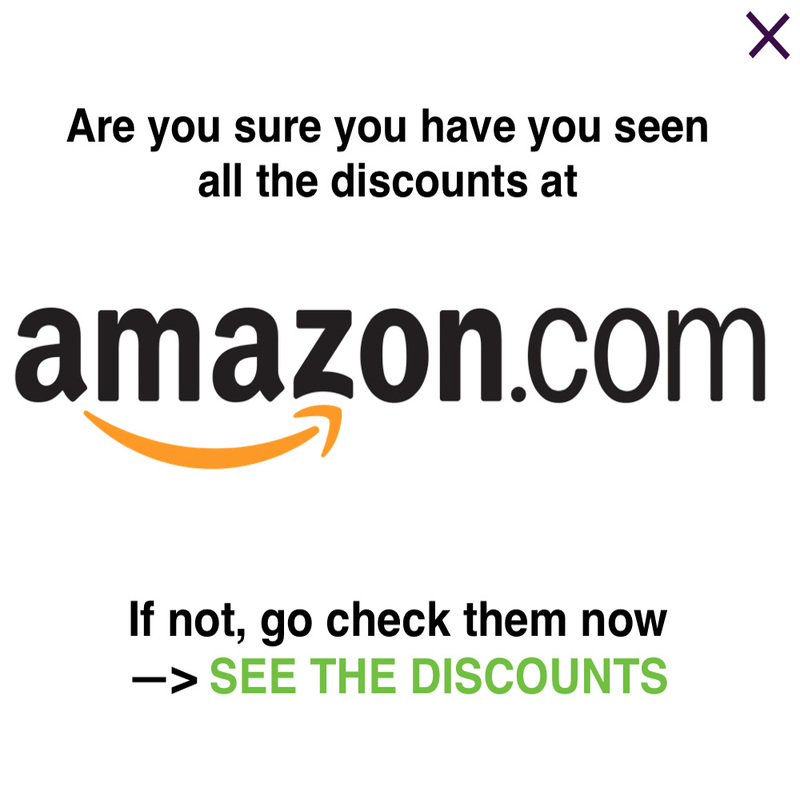 Furthermore, it has a very easy controlling that will be accessible for everyone. 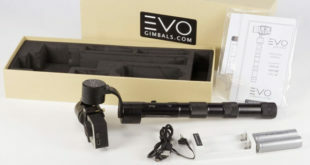 Even though it takes a few hours to get used to the different modes and uses, it will be a very good stabilizer once you are comfortable with it. The few weaknesses are the quality and reliability of the product and the stabilization. Well, it still got 8.2 and 8.3/10 in our in-depth review, but we were a bit disappointed during our Feiyu G5 review on these criteria. If you want to know more about it, we strongly recommend you to read our critique which really focuses on this. In the end, the Feiyu G5 remains a very good Gopro gimbal stabilizer which has quite a good quality/price ratio and a very useful Splash Proof function. Previous How to fix your Gopro on your gimbal stabilizer ?